The whole point of ripping DVD into WMV format is to watch it on a device that isn't connect to a DVD player or DVD disc. You rip the DVD for storage on USB hard drive/flash drive so as to playback on TV or projector screen conveniently; you convert DVD movies to WMV to watch DVD movies on stylish Xbox One, Zune, ZEN, PS4 or Surface Pro when you're on the train or trip; the digital WMV copy of DVD makes your DVD contents to video-sharing website become possible. 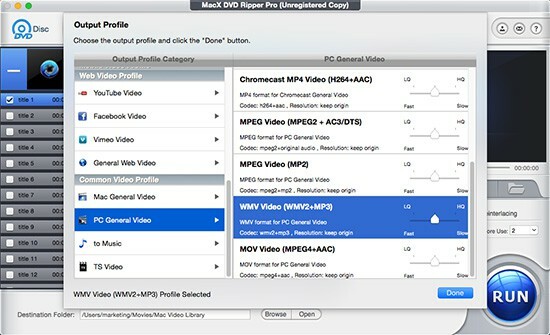 Or copy a DVD on Mac to WMV to allow the disc to be customized in your video editing software. If it is the case, you need a DVD ripper to do the conversion stuff. How about Handbrake and MacTheRipper? They are both free and Mac compatible software. Yes, if you use them to rip non-protected DVD to WMV, they won't let you down. Providing you plan to utilize them to convert protected DVD on Mac, you have to look somewhere else. Professional MacX DVD Ripper Pro may be what you need, doing well in both homemade DVDs and commercial DVDs on Mac. MacX DVD Ripper Pro always keeps users in mind, unceasingly striving to solve users problems in DVD ripping. To let users rip any DVD discs to WMV on Mac, it constantly updates to catch up the latest protections at a frequency of 1-2 weeks. Now, you're allowed to convert DVD video to WMV on Mac with whatever type of DVDs, be it commercial protected DVDs, 99-title DVDs, Disney/Sony DVDs, Lionsgate DVDs, workout DVDs, AV (Japanese) DVDs, yoga DVDs, damaged/unplayable DVDs, homemade DVDs, etc. And its updated DVD analysis algorithm can help you rip DVD to formats like WMV, MP4, H264, MOV, MKV, AVI, FLV, Microsoft device, Xbox One, PS4, Zune, iPhone iPad Android, etc. with no trouble of Disney 60GB oversized file, wrong title from 99-title DVDs, not ripping whole DVD movie, the resulting picture scrambled, etc. Rip DVD to MP4, WMV, MOV, H264, AVI, MKV, MP3, iPhone Ringtone, etc. Directly copy DVD to iPhone iPad Android, Microsoft device, Xbox One, PS4, Zune. Intel QSV CPU acceleration tech lets whole DVD conversion done in 5 mins. High Quality Engine & De-interlacing tech to yield a 1:1 lossless quality. Tweak output WMV parameters (frame rate, resolution, Bit rate, codec, etc.). Free edit WMV file (crop, trim, add subtitles/watermark, rotate, etc.). Step 1: Import DVD movie. Free download this DVD ripper to WMV on Mac and fire it up. Click "DVD" to load your DVD disc (ISO image & DVD Folder also accepted as input formats). Step 2: Select WMV as Output Format. To convert a disc to WMV on Mac, choose "WMV" from PC General Video profile or directly tick "Xbox One", "PS4" from Microsoft/Sony Devices. Step 3: Start to Convert DVD to WMV on Mac. Hit "RUN" button to begin to backup a DVD in format WMV on Mac. Only 5 mins and you can get your whole DVD movie converted to WMV on Mac. Of course, the precondition is that your computer configuration is state of the art. BTW, this three simple steps also are available to convert DVD to H264, DVD to HD video, DVD to Computer, etc. 1. The built-in "Safe Mode" is designed to provide a stable environment to rip latest DRM protected DVDs. Tick it and you can rip newest DVDs without half crash or DVD ripper only rip 5-min DVD movie issues. 2. The DVD ripper developer only allows you to use this DVD ripper for Mac to rip DVDs under fair use. Any illegal conducts of using ripped DVD files are not allowed! Do NOT rip or copy DVDs for piracy or illegal commercial purposes. Please abide by your local country or area DVD copyright protection law! 3. Those who are under age of 18, are not allowed to use this DVD ripper to rip AV (Japanese) DVD or adult DVD. Adult DVDs are unsuitable to be seen by children. Output Formats General Output Format: DVD ISO image, MPEG-2 (DVD), MKV, MP4, QT, MOV, M4V, FLV, H.264, MPEG4, AVI XviD/DivX, MTS, TS, M2TS, etc. Apple Devices: iPhone x/8/7, iPhone 7 Plus, iPhone SE, iPhone 6s, iPhone 6s Plus, iPhone 6, iPhone 6 Plus, iPhone 5S and older iPhones; iPad Air 2, iPad Pro, iPad Mini 4 and older iPads; iPod Touch, The new Apple TV, Apple TV 3, iTunes, iDVD, iMovie, Final Cut Pro. Android Devices: General Mobile Video, HTC, Samsung Galaxy (SS9/S8/7/S6/edge+, Note 5/4/Edge), Google Mobile, Huawei Mobile, Acer Mobile, Lenovo Mobile, Amazon Fire phone, General Android Pad Video, HTC Jetstream, Samsung Galaxy Tab (Note 10.1 2014 Edition), Amazon Kindle Fire, etc. Pros 1. Support 1:1 rip DVD to WMV on latest macOS Sierra. 2. Update constantly to decode all newest DVDs, 99-title DVD, Disney DVD, etc. 3. 350+ preset profiles for the latest Apple Android devices with optimal parameters. 4. World's first Mac DVD ripper to adopt Intel QSV CPU acceleration tech to speed up DVD conversion up to 250-320 FPS, 3 times faster than Handbrake and MacTheRipper. Cons 1. Unable to burn DVD. 2. Currently not cover Blu-ray disc and CD as input formats. 3. DVD movie editing features need to get improved. For those who would like to know how to free rip DVD to AVI on Mac OS could get introductions in this tutorial so that they can play DVD movies on more mobile devices. Feel free to download this free DVD to AVI ripper right now. This article shows you how to convert DVD to web video using MacX DVD Ripper Pro so that you can upload DVD to YouTube, Facebook, Vimeo, Dailymotion, etc online and share them with your family, friends, and other people in the world. This is a tutorial about how to rip DVD to MPEG free on Mac. With this free DVD to MPEG ripper for Mac, you can rip both homemade DVD and commercial protected DVD to MPEG files on Mac seamlessly. MacX DVD Ripper Pro is the best DVD to WMV converter Mac which can freely rip DVD to WMV and backup any DVD (protected DVD, workout DVD, yoga DVD, adult DVD, etc.) to MPEG-2, ISO image, MKV, MP4, MOV, AVI, etc. with original quality.